There's more to Venom than meets the eye. On Friday evening, Venom director Ruben Fleischer and actor Tom Hardy, who leads the film as photojournalist-turned-parasite-host Eddie Brock, took the Hall H stage at San Diego Comic-Con as part of Sony Pictures' film slate presentation. There, the pair unleashed new footage from Venom that revealed another symbiote will play a major role in the movie. 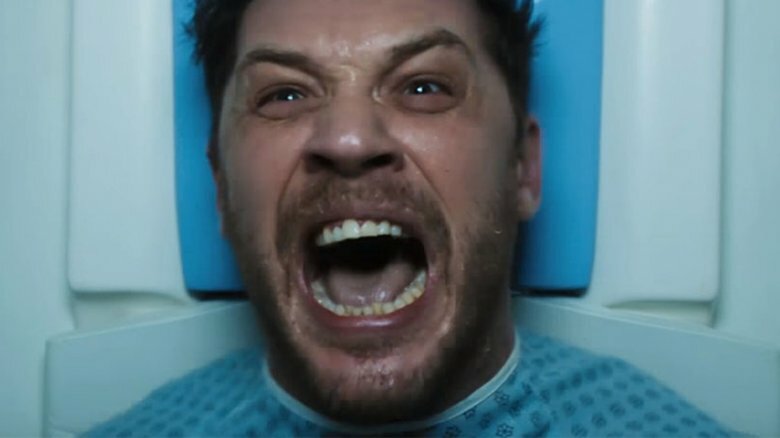 Bloody Disgusting press was in attendance at the Venom panel, and have delivered the goods on what the eye-widening reveal entailed. According to the outlet, the footage sees Hardy's character — possessed by the symbiote Venom — battling against another symbiote in a vicious showdown. The creature's identity apparently wasn't explicitly addressed in the clip, but Fleischer subsequently revealed that it is, indeed, the host-hopping symbiote Riot. In the May 1993 comic Venom: Lethal Protector #4, which Venom partially adapts, Riot bonded to the Life Foundation staff member Trevor Cole. Three years later in January 1996's Venom: Along Came A Spider #1, the symbiote took hold of Howard Ogden after it was forcibly separated from the monstrous Hybrid symbiote that had fused to prison guard Scott Washington. But within Venom, it's Riz Ahmed's Dr. Carlton Drake — the high-ranking Life Foundation who extracted five other symbiotes (Agony, Lasher, Phage, Scream, and, of course, Riot) from Venom — whom Riot selects as its temporary host. Even if Riot gets bored with Drake and chooses to kick him to the curb, the symbiote can reappear later in Venom, as Fleischer mentioned Riot is able switch hosts as often as it pleases. "He has a unique trait. You don't know where Riot is going to turn up," the director teased. So, how does the film footage arrive at this symbiote-versus-symbiote fight? Action picks up thereafter, with Venom generating "extra limbs to attack [Eddie's] enemies while on a motorcycle chase." And then, the famous Eddie-to-Venom moment happens: he stretches to seven feet tall as Venom wraps around his human form and flickers a long, slimy tongue between massive fanged teeth. Apparently, viewers "went nuts at the sight of the full Venom," which tore Eddie's opponents to pieces and "regenerate[ed] all his wounds." This all ultimately leads into Venom facing off with Riot. Elsewhere in the footage, Venom quips a hilarious one-liner as the clip implies he's eating a crook — "Eyes, lungs, pancreas. So many snacks, so little time." — and remarks that he simply "has a parasite" when he devours someone else inside a market and a cashier gives him a horrified look. Venom acting both evil and funny? Sounds like those brooding twenty-something bad boys no one can resist — except a lot slimier. Fleischer made it clear that what was shown during SDCC is rough around the edges and still needs some TLC from the VFX department, making the chances of the footage surfacing online nearly nil. The good news is that Venom is set for release on October 5, so even if fans at home never see what con-goers saw on Friday night, there isn't too much time left to wait to catch the full movie.